Each day clinicians deal with patients that have chest pain. Using a combination of clinical history, an electrocardiogram, appropriate laboratory data, pertinent physical findings, clinical decision rules and clinical judgment leads to a likely group of differential diagnoses.1, 2 The many algorithms for evaluating and managing chest pain are beyond the scope of this article.3 The purpose of this article is to discuss the specific clinical scenarios that may benefit from the use of contrast-enhanced pulmonary magnetic resonance angiography (CE-MRA) for the primary diagnosis of pulmonary embolism (PE), the current outcomes data regarding the effectiveness of this test and how to overcome the administrative barriers to implementing this test in a busy academic practice. In the emergent setting, the three most concerning chest pain diagnoses are acute coronary syndrome, aortic dissection and pulmonary embolism. More so than the other two diagnoses, PE presentations can be highly variable, ranging from subtle findings to hemodynamic instability, often in the context of no known precipitant.7 Adding to this variable presentation is the fact that pulmonary arteries do not have pain fibers. The obstruction to the pulmonary arterial circuit coupled with the cardiopulmonary reserve of an individual patient determines the degree of desaturation, the increase in respiratory rate (dyspnea), and the extent of tachycardia that develops. The pain from PE is typically a delayed reaction to the presence of intrapulmonary arterial occlusion and pulmonary infarction, wherein the lung supplied by the obstructed artery infarcts with blood leaking out into the pleural space. It is the irritation of the well-enervated parietal pleura that causes the patient to feel “chest pain.”8 Clinical decision rules (CDRs) have developed to improve the likelihood of finding pulmonary embolism. These include the Wells’ score, modified Wells’ score, the Geneva Score, the modified Geneva Score and the PERC score. 9 These CDR’s can help identify a subset of chest pain patients that will be more likely to have positive imaging results for PE. At our institution, the current positivity rate of CTA and MRA for the diagnosis of PE is in the range of 5 – 9%. Some groups have come to the conclusion that clinicians overuse imaging for PE. On the other hand, missing a treatable, yet potentially fatal, cause of chest pain is no longer defensible in a court of law. In addition, the impact of index presentation of PE, even if not clinically significant, does influence future healthcare decision making and therapy; eg, surrounding anticoagulation after orthopedic surgery. Thus, we find ourselves at a crossroads of good arguments for and against the use of liberal imaging in the clinical scenario of suspected PE. We have been using the same hardware and software configuration for our studies for the last seven years.10,11 All current scanner configurations at 1.5 and 3.0 Tesla with parallel imaging using chest multicoils (at least 8 channels) and 40mT/m read out gradients should be able to perform this breath-hold exam. One of the key features of this protocol is to dilute the contrast up to a total volume of 30 mls.12 This allows for the total acquisition, which is timed to start at the maximum signal intensity of the pulmonary artery, to be performed during contrast administration. This helps to prevent the Maki artifact.13 The key feature of this method, which is an improvement over the methodology employed for the PIOPED III study,14 is that this data is nearly isotropic with an interpolated resolution of 0.7 × 0.7 × 1.0 mm. We acquire a bolus phase followed by two delayed-phase exams. The last one uses a lower flip angle.15 The length of the breath hold is dependent on patient size and varies from 10 to 20 seconds. For patients who are unable to hold their breath for the expected scan length, administration of supplemental oxygen and use of a full inspiration may be helpful. There are many causes of chest pain. 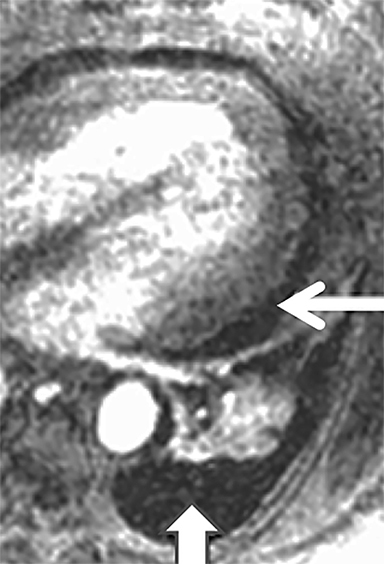 Since more than 90% of CTA and MRA exams are negative for the diagnosis of PE, can CE-MRA also find non-thrombotic imaging findings seen on CT that may help explain a patients’ symptoms? We recently published our results on this topic and have shown that CE-MRA finds as many actionable (ie, findings that require some sort of follow-up) non-thrombotic ancillary findings as has been reported for CTA in a similar setting.21, 22 The fact that CE-MRA is effective for the exclusion of clinically relevant PE and that non-thrombotic ancillary findings are capable of being imaged, suggests that CE-MRA is indeed a safe test for use in the primary diagnosis of PE (Figure 2). What patient populations may benefit from CE-MRA? The advantages of CE-MRA over CTA are: (1) no radiation24; (2) it can be safely used in those patients with a history of anaphylaxis to iodinated contrast material; (3) it can be safely used in mild to moderate renal insufficiency25; (4) it can be used to image upper extremity and upper abdominal venous thrombosis.11 We feel that in younger female patients, the repeated use of CTA for the diagnosis and follow up of venous thromboembolic disease in unwarranted and that CE-MRA should be used instead. Young women are the group most at risk from medical radiation-induced malignancy.17, 18, 26 Use of contrast agents that have alternate routes of excretion can be beneficial for those patients with impaired renal function. The use of ferumoxytol (1-3 mg/kg administered as a slow intravenous infusion outside of the scanner) in renal failure patients is a good option that avoids the issue of possible nephrogenic systemic fibrosis in this group.27 We have also recently found good success using ferumoxytol as a contrast agent in the setting of pregnancy (Figure 4). What population will not benefit from CE-MRA? All patients must be screened for MRI compatibility and safety of any implanted device. Some patients will be disqualified simply for this reason. 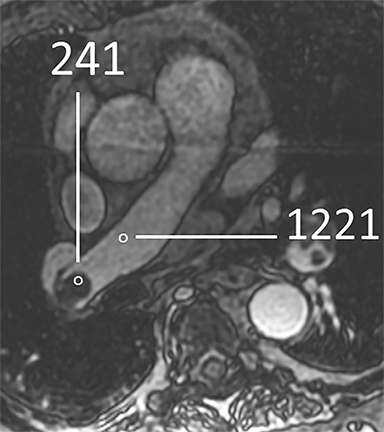 The critically ill patient with suspected massive pulmonary embolism does not belong in the MRI scanner. The ability to resuscitate patients in the controlled environment of the scanner room is very limited. Those patients that are very short of breath and unable to hold their breath for more than 10 seconds are not ideal candidates, either. Patients with underlying subtle lung disease, such as hypersensitivity pneumonitis, will likely benefit more from the use of CT. The ability to give an answer quickly is one of the advantages of CTA that MRI must strive to meet if it is to be considered as clinically useful in the emergent setting. Currently, our table time for the MRA exam is approximately 10 minutes. 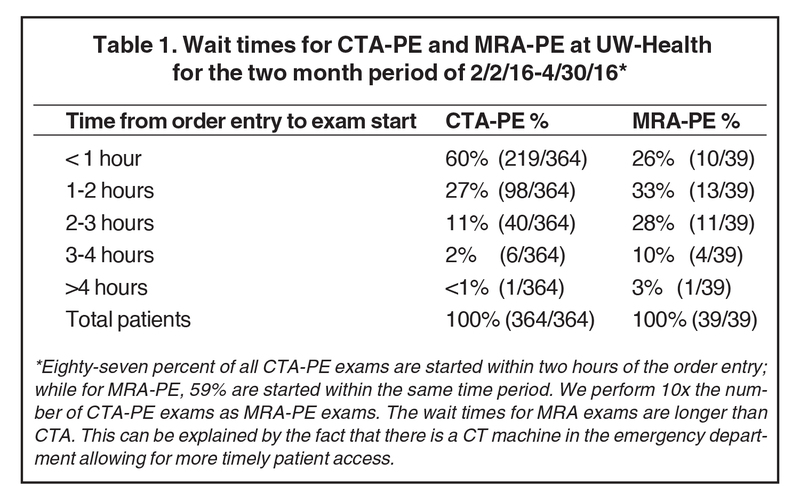 However, getting an emergent time slot to scan an emergency department patient for PE, on an already scheduled and very busy clinical scanner, can be difficult.11 Our current time to order and complete a CTA exam for PE from the ED is 98% within 3 hours of order entry, while for CE-MRA exams this is 87% within 3 hours (Table 1). It will be key to determine which approach is most clinically relevant: (1) Emergency department MRI scanner, or (2) dedicated protected time for ED studies on an MRI scanner in the radiology department. Given that the reported sensitivity of CE-MRA is quite modest (78%),16 it is fascinating that this test works for this disease at all. The truth of the matter is, we really do not know why the effectiveness (NPV) is nearly the same as CTA10 while the efficacy is 20% lower for the detection of PE.16 One possibility is that there has been a systematic overdiagnosis of this disease by CTA. 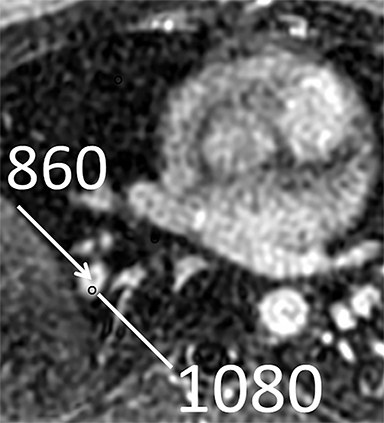 As nicely shown by Burge and colleagues, PE diagnoses have increased without a corresponding decrease in mortality from this disorder.28 This leads those authors to conclude that the use of multi-detector CT has led to the systematic over-diagnosis of this problem.28, 29 Stated in another way, venous thromboembolic disease may be a normal part of the thrombotic/thrombolytic system and the lungs have evolved to process and lyse PE as part of normal living. Our work for the last seven years has been very consistent in its results. We have shown that contrast-enhanced magnetic resonance angiography has a similar negative predictive value to computed tomographic angiography for the exclusion of pulmonary embolism. We have also found that this method is able to find those actionable non-thrombotic ancillary findings at the same rate as CTA. The current MRI scanner hardware and software configurations now allow for this procedure to be performed clinically at most institutions. Stein PD, Woodard PK, Weg JG, et al. Diagnostic pathways in acute pulmonary embolism: Recommendations of the PIOPED II investigators. Am J Med. 2006;119(12):1048-1055. Goldhaber SZ, Bounameaux H. Pulmonary embolism and deep vein thrombosis. Lancet. 2012;379(9828):1835-1846. Tapson VF. Acute pulmonary embolism. N Engl J Med. 2008;358(10):1037-1052. Piazza G, Goldhaber SZ. Acute pulmonary embolism: part I: epidemiology and diagnosis. Circulation. 2006;114(2):e28-32. Alikhan R, Peters F, Wilmott R, et al. Fatal pulmonary embolism in hospitalised patients: a necropsy review. J Clin Pathol. 2004;57(12):1254-1257. Velmahos GC, Spaniolas K, Tabbara M, et al. Pulmonary embolism and deep venous thrombosis in trauma: Are they related? Arch Surg. 2009;144(10):928-932. Stein PD, Hull RD, Ghali WA, et al. Tracking the uptake of evidence: two decades of hospital practice trends for diagnosing deep vein thrombosis and pulmonary embolism. Arch Intern Med. 2003;163(10):1213-1219. Andreucci M, Solomon R, Tasanarong A. Side effects of radiographic contrast media: Pathogenesis, risk factors, and prevention. Biomed Res Int. 2014;2014:741018. Stein PD, Beemath A, Matta F, et al. Clinical characteristics of patients with acute pulmonary embolism: Data from PIOPED II. Am J Med. 2007;120(10):871-879. Schiebler ML, Nagle SK, Francois CJ, et al. Effectiveness of MR angiography for the primary diagnosis of acute pulmonary embolism: clinical outcomes at 3 months and 1 year. J Magn Reson Imaging. 2013;38(4):914-925. Nagle SK, Schiebler ML, Repplinger MD, et al. 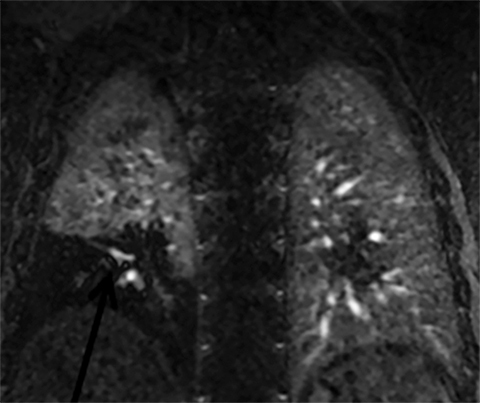 Contrast enhanced pulmonary magnetic resonance angiography for pulmonary embolism: Building a successful program. Eur J Radiol. 2016;85(3):553-563. Bannas P, Bell LC, Johnson KM, et al. 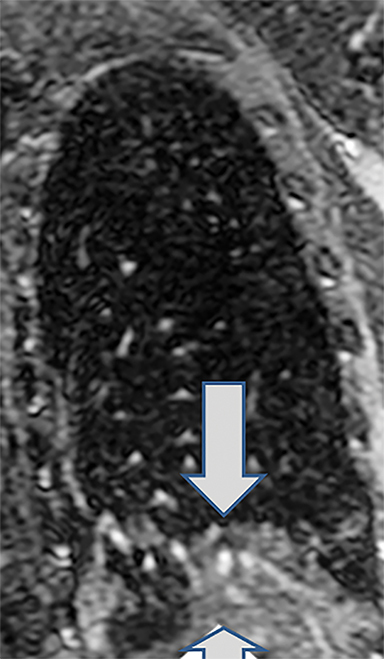 Pulmonary embolism detection with three-dimensional ultrashort echo time MR imaging: Experimental study in canines. Radiology. 2016;278(2):413-421. Maki JH, Prince MR, Londy FJ, et al. The effects of time varying intravascular signal intensity and k-space acquisition order on three-dimensional MR angiography image quality. J Magn Reson Imaging. 1996;6(4):642-651. Sostman HD, Jablonski KA, Woodard PK, et al. Factors in the technical quality of gadolinium enhanced magnetic resonance angiography for pulmonary embolism in PIOPED III. 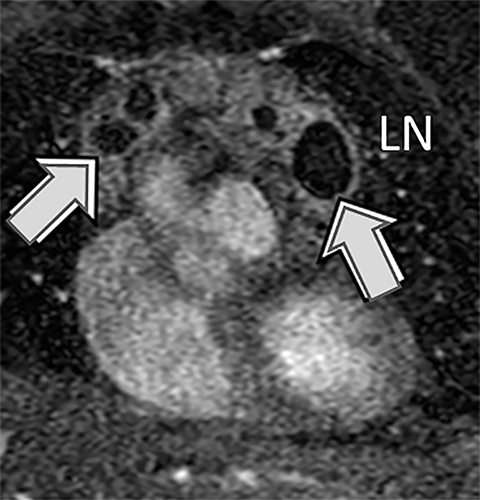 Int J Cardiovasc Imaging. 2012;28(2):303-312. Kalb B, Sharma P, Tigges S, et al. 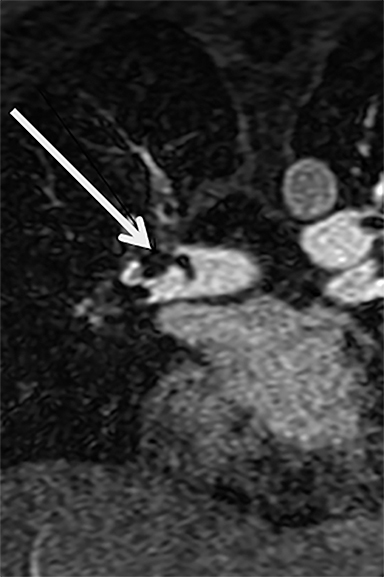 MR imaging of pulmonary embolism: Diagnostic accuracy of contrast-enhanced 3D MR pulmonary angiography, contrast-enhanced low-flip angle 3D GRE, and nonenhanced free-induction FISP sequences. Radiology. 2012;263(1):271-278. Stein PD, Chenevert TL, Fowler SE, et al. Gadolinium-enhanced magnetic resonance angiography for pulmonary embolism: A multicenter prospective study (PIOPED III). Ann Intern Med. 2010;152(7):434-443, W142-3. Brenner DJ. Radiation and chest CT scans: Are there problems? What should we do? Chest. 2012;142(3):549-550. Brenner DJ. What we know and what we don’t know about cancer risks associated with radiation doses from radiological imaging. Br J Radiol. 2014;87(1035):20130629. Schiebler ML, Repplinger FC, Vigen K, et al. Effectiveness of pulmonary MRA for the primary diagnosis of PE: Outcomes analysis of 578 consecutive symptomatic patients. Poster LL-CHS-SU4A Radiological Society of North America (RSNA) 99th Scientific Assembly and Annual Meeting Chicago, IL. François CJ, Hartung MP, Reeder SB, et al. MRI for acute chest pain: Current state of the art. J Magn Reson Imaging. 2013;37(6):1290-1300. Schiebler ML, Ahuja J, Repplinger MD, et al. 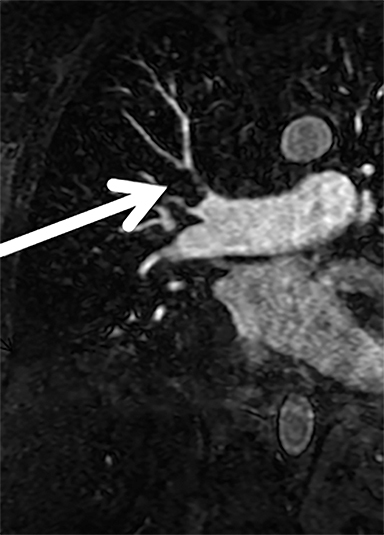 Incidence of actionable findings on contrast enhanced magnetic resonance angiography ordered for pulmonary embolism evaluation. Eur J Radiol. 2016;85(8):1383-1389. Richman PB, Courtney DM, Friese J, et al. Prevalence and significance of nonthromboembolic findings on chest computed tomography angiography performed to rule out pulmonary embolism: A multicenter study of 1,025 emergency department patients. Acad Emerg Med. 2004;11(6):642-647. Bannas P, Schiebler ML, Motosugi U, et al. 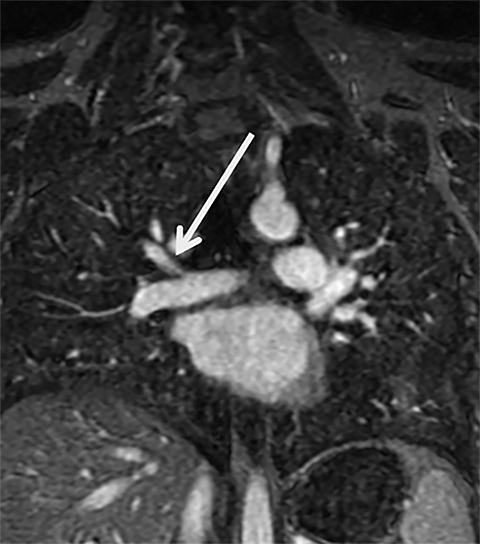 Pulmonary MRA: Differentiation of pulmonary embolism from truncation artefact. Eur Radiol. 2014;24(8):1942-1949. Pleszewski B, Chartrand-Lefebvre C, Qanadli SD, et al. Gadolinium-enhanced pulmonary magnetic resonance angiography in the diagnosis of acute pulmonary embolism: A prospective study on 48 patients. Clin Imaging. 2006;30(3):166-172. Soulez G, Bloomgarden DC, Rofsky NM, et al. Prospective cohort study of nephrogenic systemic fibrosis in patients with stage 3-5 chronic kidney disease undergoing MRI with injected gadobenate dimeglumine or gadoteridol. AJR Am J Roentgenol. 2015;205(3):469-478. Brenner DJ. We can do better than effective dose for estimating or comparing low-dose radiation risks. Ann ICRP. 2012;41(3-4):124-128. Hope MD, Hope TA, Zhu C, et al. 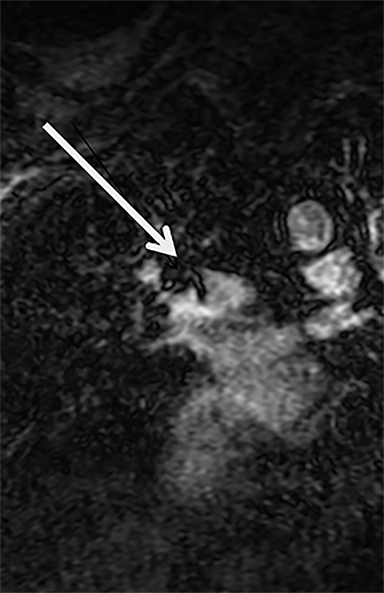 Vascular imaging with ferumoxytol as a contrast agent. AJR Am J Roentgenol. 2015;205(3):W366-73. Burge AJ, Freeman KD, Klapper PJ, et al. Increased diagnosis of pulmonary embolism without a corresponding decline in mortality during the CT era. Clin Radiol. 2008;63(4):381-386. Freeman LM, Glaser JE, Haramati LB. Planar ventilation-perfusion imaging for pulmonary embolism: The case for “outcomes” medicine. Semin Nucl Med. 2012;42(1):3-10. Schiebler ML, Hamedani, AG, Runo J, Francois CJ, Repplinger MD, Reeder SB, Nagle SK. CE-MRA in the primary diagnosis of pulmonary embolism: Building a team to start a clinically relevant program. Appl Radiol. 2017;46(1):31-36. Dr. Schiebler is a Professor of Radiology; Dr. Hamedani is a Professor of Emergency Medicine; Dr. Runo is an Associate Professor of Medicine; Dr. Francois is an Associate Professor of Radiology and Medicine; Dr. Repplinger is Professor of Emergency Medicine; Dr. Reeder is a Professor of Radiology, Emergency Medicine, Medicine, Medical Physics, and Biomedical Engineering, and Dr. Nagle is an Associate Professor of Radiology, Medical Physics, and Pediatrics; at the University of Wisconsin-Madison Schools of Medicine and Public Health. Disclosure: The UW-Madison Department of Radiology has an ongoing research affiliation with General Electric.